Yes, my pressure cooker has been working hard these days. Only last week I shared a recipe for chicken thighs, and now a very nice chili made in 30 minutes. Thanks to the power of pressure, it delivered the same luscious flavor of one left on the stove top for hours, simmering away. 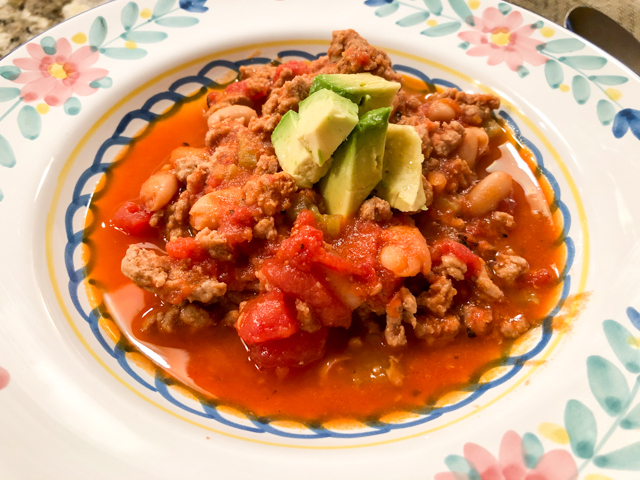 I was not too fond of beans in chili, in fact it’s the first time I made it this way. It won’t be the last. Surprising how well the flavors mingle, with the beans giving a nice creamy feel to the chili without any addition of extra fat. Heat the olive oil in the pressure cooker, add the onion and celery, season lightly with salt and pepper. Sautee until translucent and fragrant. Add the ground turkey and cook in high heat until well-seared. Add the salt, pepper, chili powder, paprika and cumin. Mix well. Add the tomatoes, kidney beans, and enough water to almost cover the meat, if needed. Close the pressure cooker, let it come up to full pressure, and cook for 20 minutes. Release the pressure quickly, and if needed, reduce the liquid by simmering for a few minutes with the lid open. Serve with the garnishes of your choice. Note to self: try to always keep some parsley or cilantro in the fridge! I have an electric pressure cooker but not an instant pot. 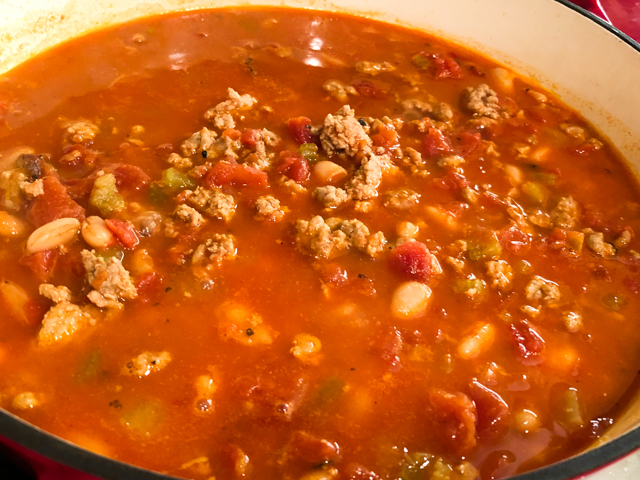 This time of year it gets a lot of use and chili is one of our favorites. Happy Thanksgiving! What a lovely recipe for turkey mince . . . even chicken mince would do, methinks 🙂 ! Down Under naturally we do not prepare anywhere the number of chilli dishes as you do up north, but I do like your spices. And the dish will be very happy to be made in my Le Creuset pot on the stove, the aromas reaching into my work office ! Am looking at Instapots, some sold at attractive sales prices . . . the busy kitchen counters tend to protest . . .Happy Thanksgiving to both of you and yours . . . This looks so delicious. Bring some over! I have lots of cilantro and parsley on hand!